"Daring to go where most brides fear to dream, SASHA by Madi Lane expertly navigates drama and danger. Her high neckline both conceals and reveals her sweetheart bustline and illusion back which is secured by covered buttons that adorn her spine. With flare and femininity she channels all things fun and frivouslous and presents them wrapped in a satin bow that draws in the waist and pulls her whole look together. She is at once a demure and dramatic choice." Bow can be easily removed. 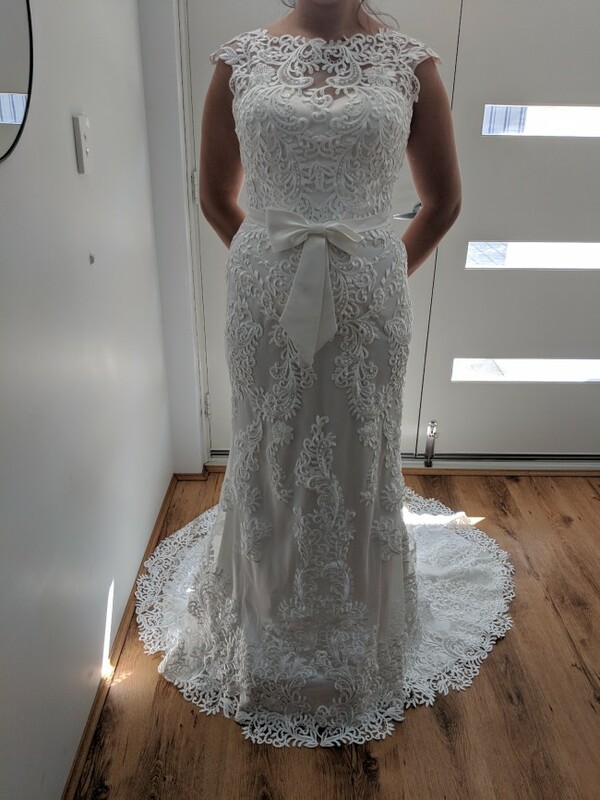 Never worn at a wedding, worn twice to fit on and for these photos. Initially bought for my own wedding however I am now wearing a different dress. It is a beautiful dress that is guaranteed to look stunning on anyone. Once you send a message, Madeline can invite you to purchase the dress.